Overactive bladder, or the need to urinate more often than usual, can result in self-esteem and anxiety problems in teenagers. Teens affected by this condition often find themselves seeking out restroom locations at school, in the workplace or at social events. In addition to being an inconvenience, overactive bladder in teenagers can signal certain medical conditions as well. When overactive bladder persists, medical intervention is recommended to determine the cause. Caffeine intake may cause overactive bladder in teenagers. According to KidsHealth.org, caffeine stimulates bladder function because it is a diuretic, which means that it increases the urge to urinate more often. It is also known to cause nervousness in teens, which can also promote the need to urinate more often. Caffeine is commonly found in coffee, tea, energy drinks and colas, and its effects can be seen hours after ingestion. Reducing caffeine intake can help mitigate the symptoms of overactive bladder. In addition to abdominal pain and pressure, painful urination, fever, chills and nausea, urinary tract infections can cause symptoms of an overactive bladder, producing only scant amounts of urine, according to HealthyChildren.org and the American Academy of Pediatrics. A three-day course of antibiotics is usually recommended to manage urinary tract infections; however, other measures such as drinking plenty of water may help as well. In addition to increased thirst and hunger, type 1 diabetes or juvenile diabetes can cause overactive bladder in teenagers, according to the Mayo Clinic. Symptoms of juvenile diabetes often appear suddenly. Overactive bladder related to diabetes is often accompanied by other symptoms such as fatigue, visual deficits, weight loss and yeast infections. Treatment for type 1 diabetes includes strict monitoring of blood glucose levels, the administration of insulin, getting moderate exercise and making dietary modifications. There is a strong link between overactive bladder in teenagers and constipation. 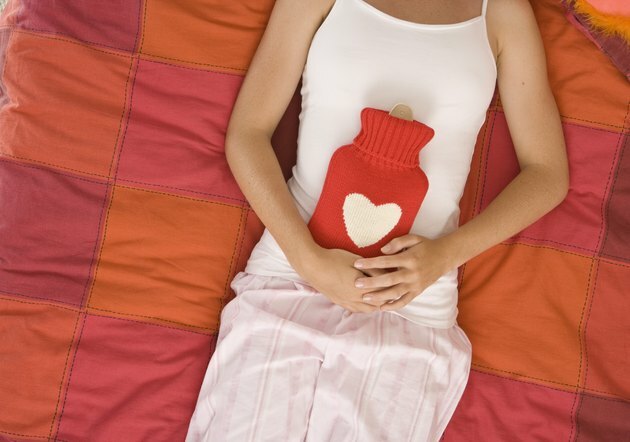 Management of overactive bladder, in this instance, is to treat constipation, according to Israel Franco, from the Department of Urology, New York Medical College, Valhalla, New York. Methods for relieving constipation-related bladder problems include drinking eight glasses of water per day, eating a diet rich in fruits, vegetables, lean proteins and fiber, and getting moderate daily exercise.